I wish all cars with DOT track tires could be posted. admittedly i can be quite ignorant sometimes, so i suppose this post is a message to everyone on fastestlaps.com. I am sorry. I know, i always say american cars are superior to european ones, but in truth it is probabaly more even. lol that shut him up. To be honest my expectations were low for someone such as yourself. You expected me to call? No E, i do not work for porsche. I currently work at HKS, but we were pulled in for sparkplugs and Exhaust management. Although i myself did not make these parts, my team helped to develop them. No, i do not have any sources, and i understand that you need them, i was just saying that this site is highly innacurate. By the way E, well done for avoiding calling me. Only figures that can be backed by a reputable source are accepted. Keep it going guys--there's nothing like a good fight! Well, no offense, but coming in and demanding a time change while only claiming you worked on the car isn't a good way to convince someone. You saying you designed something doesn't mean you designed it; and your designing said thing doesn't mean that whatever you say about it is true. If you were/are an engineer, I'd expect you to know this. I assume your "proven wrong" is about you being employed at Porsche or something. It doesn't let you get around needing a reference for the performance you're claiming. Perhaps that's what you think, but from your most recent message, i understand that you seem to think i am ignorant. Please call me and discuss this if you wish: 4134970033. I understand if you are scared to be proven wrong, or cannot afford a phone. Well, the only times accepted are those that can be backed up by sources. It says 4.2 seconds because someone took 4.2 seconds to accelerate the car. If you want to change that all you need is a source. My original response to your post was an exaggerated attempt to show that your post had no reliable evidence to warrant changing the time, though it seems to have failed in getting its intended message across. Isn't this car more powerful? Of course there are no "correct" acceleration times to a specific decimal place. Weather, driver, the amount of fuel on board, there are many variables that affect the performance of a car. However, the time must be fairly accurate, otherwise this site becomes pointless. What the mag tests, dyno tests, whatever say, is what's in the stats section. Where do you think the stats come from? Certainly someone who designs some component of the car will know that there is never a "correct" acceleration or lap time. And they should know how to source something. If all of these mag tests and dyno tests out there have better info, by all means bring them. okay e, take your meds. why is there always one guy on every site who thinks thy are better than everyone else? We dont know that what clarke said was true by him, but by dyno tests, official stats, and magazine tests. oh, and im suuuuure you invented every car in the world you dumbass. Very convincing sources, I'm sure you will persuade us all. BTW, I invented every car in the world, and checked them all. The site is correct. I said so, so I'm right. ummmm... 444bhp me thinks. in fact me knows. i helped to develop the engine. this website knows nothing. seriously. i mean, enzo 0-60 ( 100kmh) in 3.6??? try 3.1, or 3.3 MFR estimate. ford gt is all wrong, there is no 2010 gt500, just the convertible, GTR? wrong. LP670? wrong. all the aston martins? wrong. alot of people how test cars get different test resaults. 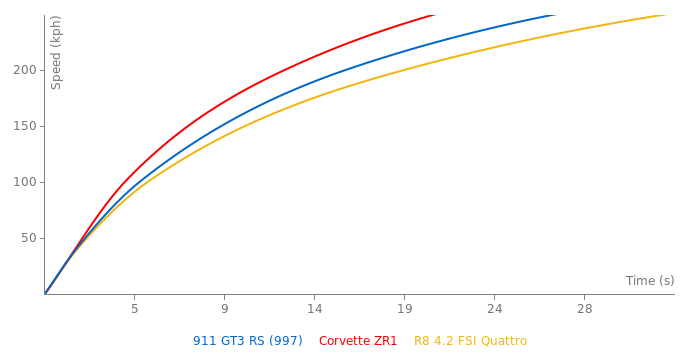 the GT3 does NOT get to 0-60mph in 3.5 seconds. its 3.8 seconds to 60.
the gt3 rs corner's faster then alot of expesive sport's car's but i am very impressed bye the fact that it get's to 60mph in 3.5sec that's faster than a 911 turbo infact however got the gt3 rs to 60mph in only 3.5sec must be very good.why would you want a 911 carrera it's practical for evry day use and has 4 seat's and is fairly fast but know where near as fast as a gt3 and a gt3 is much more fun to drive in.the gt3 rs is pretty mutch a road legal race car that destroy's any corner at an insane speed. dude alot of people have tested the cgt and the got 3.5 so..
this 911 997 gt3 rs would probably corner faster than a carrera gt because the 911 997 gt3 rs wieghs only wieghs 3025lbs and is designed for fast cornering on test tracks with sharp corners.Although the 911 997 gt3 rs would not be any where near as fast as a carrera gt on striaghts because the 911 997 gt3 rs only has 415hp and and 300ft of torque the 911 997 gt3 rs only has a flat 6 if some one tested this 911 997 gt3 rs in acceleration i would guess around the late 4secs.the carrera gt is a 5.7LV10 engine with a tremendous 604hp and 435FT of torque if some one tested the carrera gt acceleration they could get to 60mph in the low 3secs. dude its a porsche track car...what do you expect..
A 911 997 gt3 rs is 800lbs lighter than a MercedesMclarenSLR do you think 911 997 gt3 rs could corner faster than a MercedesMclarenSLR.